When you want to start dropshipping, you will find two popular platforms being recommended: Shopify and WordPress (using AliDropship plugin). The truth is that there are many platforms you can use for your dropshipping site. However, Shopify and WordPress (using AliDropship plugin) are the most popular. In this AliDropship vs Shopify article, I will go through an overview of the two platforms and compare them head-to-head so that you know how they stick against each other. At the end of the article, you will know whether to use Shopify or AliDropship plugin with WordPress for your dropshipping store. But first, why should you start dropshipping? The internet has brought up many business opportunities, and dropshipping is just one of them. Starting an online dropshipping store is easy today thanks to platforms like WordPress and Shopify that do all the heavy lifting for you. You can start a professional online store with less than $500. If you really bootstrap, you can even start your store for less than $200. The best thing with dropshipping is that you do not have to pay for inventory upfront. This is why the cost of starting the business is low. Most of the time, the cost is tied to setting up the online store. Things like marketing can be done for free. Moreover, for products, you do not handle any shipping or packaging. These two activities will be handled by the dropship supplier. At this juncture, you must already know how dropshipping works. So, if you are ready to get into the business, which platform between Shopify and AliDropship plugin with WordPress should you use? Read on for an overview of both Shopify and AliDropship. Shopify is one of the most popular e-commerce platforms in the world, and for good reason. When I started by dropshipping business, I used Shopify to build my store. I still have some stores that are running on Shopify. Shopify makes it easy for anyone to have a fully-functional online store in record time. In fact, you can have a fully-functional store in just a few hours with Shopify. What makes Shopify great is that it is self-contained. What I mean by this is the team at Shopify will handle all the technical requirements of your online store. Here, I’m talking about payment security, uptime of the website, and so on. Shopify is offered in different packages, which you can effortlessly upgrade depending on your needs. When you set up your online store with Shopify, you will not have to pay any hosting fees. You will not have to handle any technical tasks of setting up the website. Shopify takes care of these on their own. However, like you can see, using a subdomain name does not make your business ooze professionalism. Therefore, I would recommend you purchase your own domain name. You can purchase a domain name from Shopify or your favorite domain registrar (like Namesilo which sells .com domain names for less than $10 and offers free Whois). Special for you: Use coupon code ECOMMERCEVALLEY to save $1 when registering a domain name at Namesilo. After buying a domain name, you can point it to Shopify by changing the Nameservers. Shopify has a simple and straightforward interface that makes it easy to use. Whether you are setting up a new store or would like to customize an existing one, you only need to click a few sections to change the text, images, or layout of your store. You can have a professional Shopify store that looks like a big brand store, which is important in helping to converting visitors to customers. When it comes to customer case, Shopify is one of the top tech companies that cares about its customers. The company has live chat 24/7. The customer care team is also available in different native languages. I’ve contacted the Shopify support team a number of times and they’ve been able to solve my problems promptly. Shopify effortlessly works with the main payment gateways that your customers may prefer. Customers can pay for your products using all the major credit cards through Stripe and PayPal. There is even an option of accepting payments through a merchant account, if you have one. I also love the Shopify API which can work with almost any payment gateway. You will need a developer to integrate the API with your custom payment gateway. However, for most people, PayPal and Stripe will be all they need. Your Shopify store is also secured for free using SSL technology. Therefore, your customers can shop with confidence on your store. The SSL security helps you to curb fraud and protects your customers’ credit card data. Finally, your Shopify store will be online 99.9% of the time. When the store goes down, perhaps due to bugs, the technical team will handle the matter for you. In my 4 years of running Shopify stores, my stores have never gone down due to attacks. Occasionally, Shopify will inform you of intended upgrades on their servers that can make your store be inaccessible for a few minutes. I think I’ve only encountered two times when they did an upgrade that made my site inaccessible for a few minutes over the last 4 years. Shopify is a great platform to start your first dropshipping store. However, there are some drawbacks that you should know about it before signing up for a plan. The biggest drawback for anyone starting a dropshipping business is lack of enough funds. With Shopify, you will have to pay a monthly recurring fee to keep your store online. The Basic plan starts at $29/mo. However, this plan only offers basic features and attracts higher transaction fees. If you would like more advanced features, you will have to upgrade to a higher package. When beginning your dropshipping store from home, you may not need the advanced features offered in the higher packages. Therefore, the Basic Plan of $29/mo. will be just fine. The only issue is that the cost can end up being quite high when you look at it cumulatively. For example, if you sign up for the $29/mo. plan, you will end up having paid $348 in one year. This amount is not high if you will be making money with your store. However, considering you may have other costs for marketing your store, you may wish to save the money. Most of the apps you will need are paid. If you add the cost of Shopify and the cost of the apps, your monthly charges can go up quickly. Sometimes, your store can be kicked off the Shopify platform due to various reasons. The most common reason is engaging in risky business such as selling counterfeit merchandise. You shouldn’t have to worry about this problem if you are selling legitimate products, though. Now, let’s look at what AliDropship has to offer. AliDropship is one of the most popular AliExpress dropshipping plugins for WordPress. With this plugin, you can effortlessly import products from AliExpress directly to your online store made of WordPress. Moreover, you are not tied to using AliExpress dropship suppliers only. You can use any other dropship suppliers together with AliExpress suppliers on your website. For example, you can dropship products from Amazon or eBay using other plugins on the same website. For an in-depth review on how AliDropship works, read here. Below is an overview of AliDropship plugin. The AliDropship plugin features make it easy to manage your dropshipping store. The plugin should be installed on a WordPress store. Therefore, you need to have some experience with WordPress. However, the plugin is not difficult to use. Importing products from AliExpress is simply a matter of using a Search function or going directly to AliExpress and importing the products through the Chrome extension. Check the video below to see how to import products into your WordPress store using AliDropship. One of the main reasons why most people use AliDropship plugin is that it only costs a one-time fee. The current price of the plugin is (check here). The price entitles you to lifetime access to the plugin, future updates, and support. If you do not have experience with WordPress, you can get a custom AliDropship store that will have all the products imported and ready to be promoted to your customers. Read more about AliDropship custom store here. I recommend getting a custom store made if you do not know how to use WordPress or would simply like to get your store up and running as quickly as possible. AliDropship has a number of high-converting themes that will make it easier for your customers to trust your brand and buy your products. The themes also work with Woocommerce, in case you are currently using the plugin on your WordPress store. The free themes do not really give AliDropship an edge over Shopify since the latter also offers free themes. You can use AliDropship plugin to import products from AliExpress to your WordPress online store in bulk. There is no limit on the number of products that you can import. However, keep in mind that importing too many products can slow down your computer. You may want to import the products in small batches to speed up things. AliDropship makes it easy to manage your inventory, including importing and auto fulfilling them. Without the plugin, you will have to manually add the products to your store and fulfill them. AliDropship offers great customer service and support. The team offers support through email 24/7. You can also open a support ticket to get any issues with the plugin solved. In addition, there is an active online community forum where you can raise any issues you encounter with the plugin for other users to help you. AliDropship also integrates with all the major payment gateways (including Stripe and PayPal). No matter where your customers are around the world, you will be able to receive payments on your store through AliDropship plugin. AliDropship is a standalone solution. Therefore, you will need to know how to set up a WordPress site. You will have to do some technical stuff on your own. For example, you will need to have a hosting account and know how to install WordPress on your server. The process is not really complicated. You can follow this handy guide on how to install WordPress for your online store. Since AliDropship is a WordPress plugin, you should be familiar with how to navigate around WordPress at the backend. The plugin works like any other WordPress plugin and shouldn’t give a headache when importing products or tinkering with the settings. Since you will be hosting the AliDropship plugin on your website, you will be in charge of security issues. You will need to secure the website with SSL certificates and configure the website properly to ensure it is secure from hackers. Generally, if you know how to work around WordPress, you will have an easy time with AliDropship plugin. On the other hand, if you have no experience with WordPress and do not have the time to learn, you should go for Shopify. AliDropship vs Shopify: Which is the Best Dropshipping Platform? The above is an overview of Shopify and AliDropship plugin for setting up dropshipping sites. In the table below, I compare the two options against each other with regards to the task of setting and managing a dropshipping store. You can buy a custom store with the hosting already set up. You can buy a custom store with a theme already customized. From the review above, one thing is clear: both Shopify and AliDropship (WordPress) are great platforms for starting a dropshipping business. In fact, I have stores with both platforms. Who is AliDropship Best For? The right platform to go for will really depend on your technical skills related to website development. If you know how to work with WordPress and can install a website on your own, then AliDropship will be a great option. With AliDropship, you will not have to worry about recurring monthly fees. However, this also means you will be in charge of your technical details. For this reason, you may want to choose a managed hosting provider to handle the technical aspects of your server. If you have a small budget, you can go with one of the ecommerce hosting solutions for small businesses that I recommend. 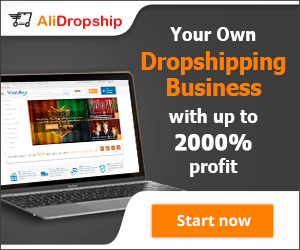 If you still want to start a dropshipping business at a low cost but don’t want to go through the technical hassle of setting up the servers and the website, you should consider getting a custom made store from Alidropship. This is a fully functional store that is preloaded with products and ready to accept payments. Read more about the custom stores here. Coming over to Shopify, the platform is easy and ready to use out of the box. You will still need to do a few things to customize your store to look the way you want. Here, I’m talking about installing the themes and customizing them. However, all the technical aspects of hosting the website will be handled by Shopify. You will not have to worry about your site getting hacked or going down due to errors. All this is covered by Shopify. The main downside of Shopify is the cost. You will have to pay a monthly cost for Shopify. Apart from this, you may also need to pay for some apps, and these costs can quickly add up.